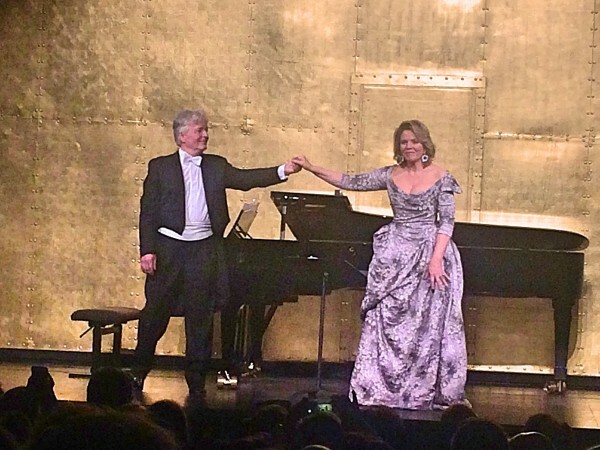 Renée Fleming and Hartmut Höll at Théatre des Champs Élysée in the first part. Foto Henning Høholt. 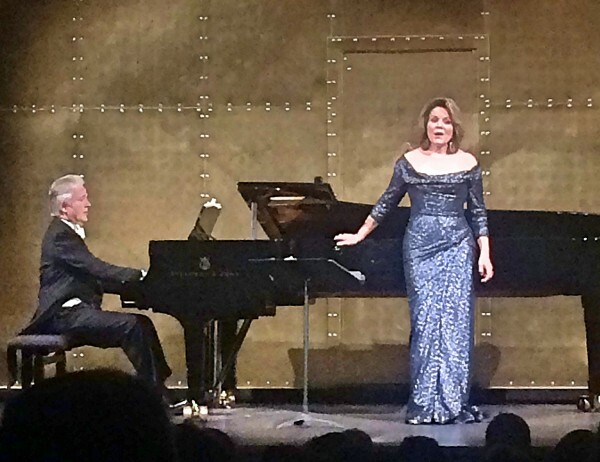 PARIS/FRANCE: The américain world soprano Renée Fleming is back at the scène of the Théâtre presenting a program of Lieders and opera parts. 10th October she visited Théâtre des Champs Élysées, Paris. It was an extraordinary well prepared concert that met all the international audience in Paris, with many highlights from Brahms, Massenet, Fauré, Saint-Saëns, Oscar Strauss, Kornauth and Richard Strauss. Her voice is outstanding, bringing all nuances, details and beauty in to the texts and the music she deliver. Extraordinary. Personally I appreciated Fauré´s Mandoline, Cinq Mélodies «de Venise», Op. 58, Brahms Wiegenlied and Canteloube´s Extraits des Chants d’Auvergne. Furthermore the three generous encores: Dvorak´s from Rusalka, Gershwins Summertime and Schuberts Ave Maria. Her pianist Hartmut Höll is excellent following up his primadonna, and she feel safe. Looking at the program composition. And through very many years making programs, also for and as pianist and music chief together with female opera singers. I personally would have moved the Richard Strauss program from Ariadne of Naxos, who ended the official part of the program.Instead to ending the first part of the program, and then have moved the “lighter” numbers from the first part to the ending of the second part. When audience is starting to get tired, it will always be preferred to have the heavier part first and then the lighter after the break. However with the three lighter encores, it became a happy ending. However a wonderful evening with a wonderful world star. Renée Fleming and Hartmut Höll at Théatre des Champs Élysée, after the final part. Foto Henning Høholt.